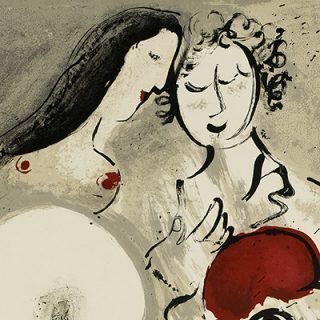 From the collection of the Israel Museum in Jerusalem, 140 works by Marc Chagall, one of the bestloved artists of the 20th century, are now in Italy for the first time. So universal as to be known, recognized and loved by everyone, he of all the artists of the last century remained true to himself while going through wars and catastrophes as well as political and technological revolutions. 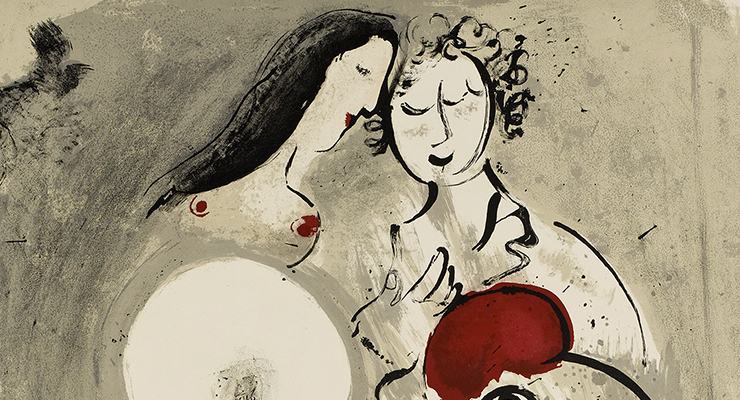 Through drawings, some oil paintings, gouaches, lithographs, etchings and watercolours, the show reveals an artistic vision influenced by Chagallʼs great love for his wife Bella and grief over her early death in 1944. It traces the course of his life and his art, a mixture of the major European traditions, from his original Jewish and Russian culture to the meeting with French avant-garde painting. 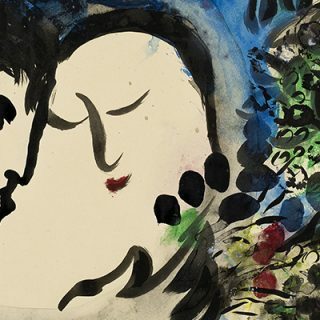 Curated by Ronit Sorek and produced by DART Chiostro del Bramante and the Arthemisia Group in collaboration with the Israel Museum under the patronage of Roma Capitale, the exhibition CHAGALL. LOVE AND LIFE will be held in the Chiostro del Bramante from 16 March to 26 July 2015. Founded in 1965, the Israel Museum houses art collections bound up with Jewish culture from prehistoric to contemporary times. These could hardly fail to include Chagall, whose works were donated by the artist himself, his daughter Ida and supporters of the institution, which celebrates its fiftieth anniversary this year and is marking the occasion with this exceptional loan for display in the Bramante Cloister in Rome. The eight thematic sections draw the complex, kaleidoscopic artistic and spiritual map that underlies the artistʼs stateless profile. Chagallʼs extraordinarily original art is in fact born out of the assimilation of the three cultures to which he belonged: the Jewish, from whose visual tradition of ornate manuscripts he drew the sometimes mystical expressive elements of his work with their disregard of perspective; the Russian, drawing alike on the images of religious icons and those of the popular prints known as luboki; and the great Western tradition of painting from Rembrandt to the avant-garde. 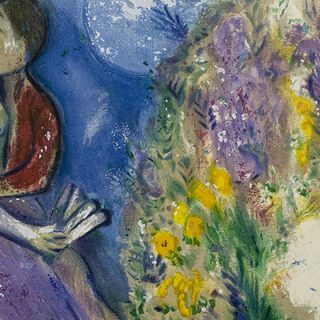 Chagallʼs work does not end here, however, as his entranced wonder at nature and living creatures endows his 20th-century art with almost medieval archaism. 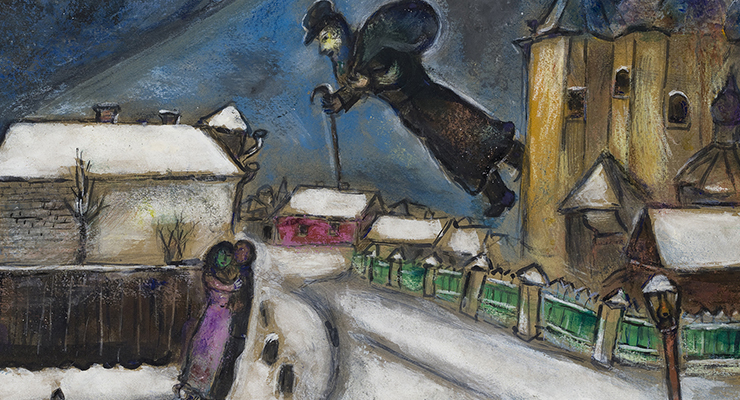 Including drawings, some oil paintings and prints from the Israel Museum, the exhibition focuses in particular on graphic works in its examination of Chagallʼs key themes, from his roots in his hometown Vitebsk (Byelorussia), described with love and nostalgia in the series My Life, to his meeting with his beloved wife Bella Rosenfeld, whose books Burning Lights and First Encounter were published with his illustrations after her early death. An entire section is devoted to the illustrations of the Bible with themes that always fascinated the artist and reveal an extraordinarily “humanistic” interpretation of the Scriptures and especially the Old Testament as a series of historical meetings between God and mankind. In addition to a far broader variety of themes than most of his contemporaries, Chagall expressed his art in numerous fields such as painting, sculpture, mosaics, stage design, writing and printmaking. The latter is examined in depth in the exhibition to show the peculiarities of the works executed with the various techniques of lithography and engraving. A blow-up in the third room shows the interior of the renowned Mourlot printing works in Paris with the ancient presses on which Chagall worked, as did Picasso, Matisse, Braque and Giacometti. 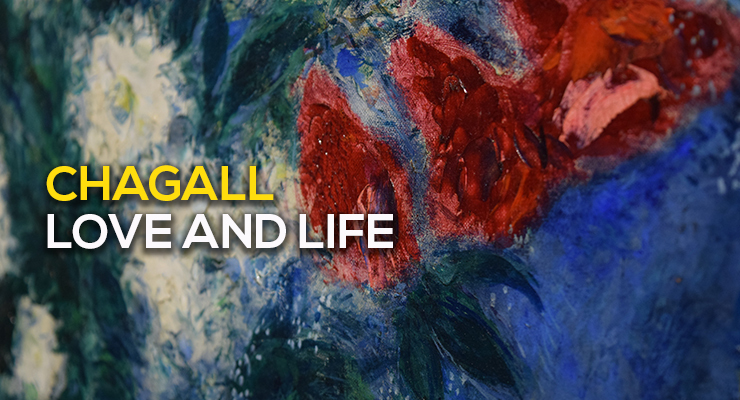 Light is also shed on the relationship existing in Chagallʼs work between art and literature, language and content. 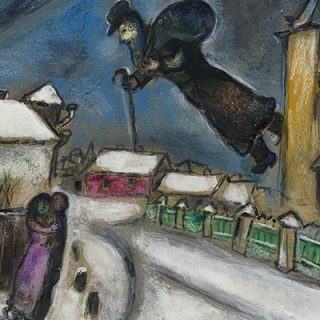 The works exhibited reflect the multifaceted identity of the artist as a Jew from Vitebsk (Above Vitebsk, 1920), an author and the illustrator of books by his beloved wife Bella as well as the Bible (Fallen Angel, gouache, 1924), an original modern painter who used Christian iconography to lament the fate of the Jewish people (Crucifixion, gouache, 1944), a man deeply familiar with the work of the Russian writer Nikolai Gogol (his frontispiece for Dead Souls and 15 of the 96 etchings of 1948), and a Frenchman by adoption who also produced illustrations for La Fontaineʼs fables (18 watercolours, etchings and gouaches). 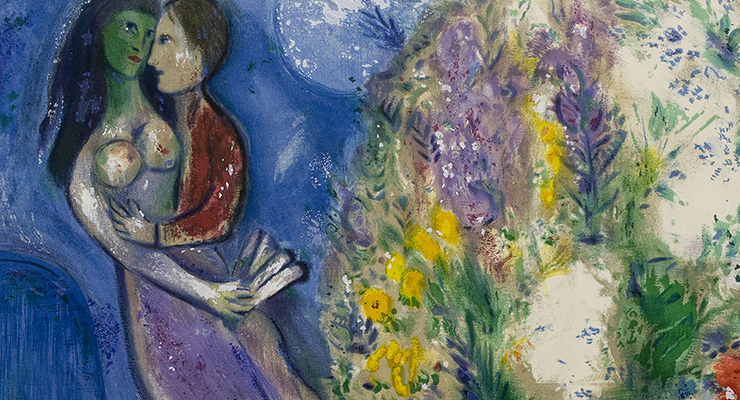 With his great understanding of the soul and ability to portray human weaknesses without making judgments (as Susan Compton wrote in the catalogue of the exhibition of 1985 at the Royal Academy in London), Chagall celebrates love as a divine gift in works like The Lovers (oil on canvas, 1937), Two Lovers and Flowers (lithograph, 1949), Two Lovers with a Rooster (lithograph, 1951) and The Lovers (gouache, 1954–55). The exhibition also includes depictions of family and friends (Dr I. A. Eliashev and Ala Eliashev, both graphite on paper, 1919) and himself (Self-Portrait with a Smile and Self-Portrait with a Grimace, both etchings of 1924–25), which demonstrate his mastery of line and surface as well as colour. Particular attention is focused on the scenic design of the rooms and the communication of content to visitors as they proceed through the exhibition. In one room, the projection of four works by Chagall so that they gradually take shape on the wall enables visitors to observe the different compositional phases as though the paintings were being born before their eyes. Background music gives the overall perceptual experience a multisensory character. Moreover, to ensure that everyone enters fully into the world of this great figure of the 20th century, visitors will be able to arrange magnetic elements on the “classic” background of a work by the master so as compose their own personal Chagalls for photographic immortalization. For “full immersion” in Chagallʼs entrancing poetic vision, the last room features a wall projection of one of his more important works, namely The Walk (a gouache of 1919 is also on show). Visitors are invited to enter the atmosphere of the painting and immortalize their own faces in place of the lovers so as to take away a personal memento of the event and the great love of Marc and Bella, whose one hundredth wedding anniversary falls this year. The exhibition CHAGALL. 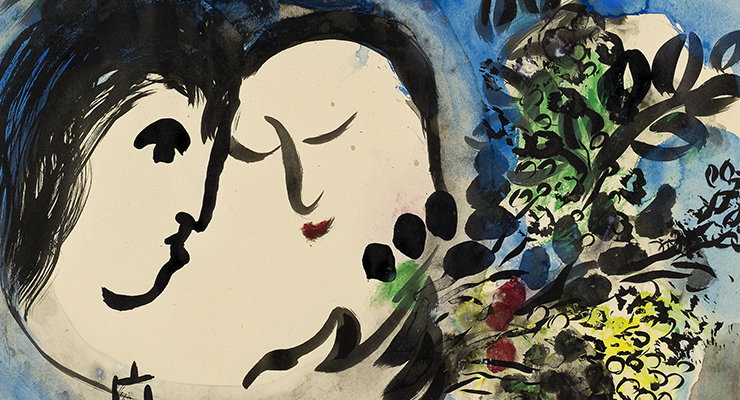 LOVE AND LIFE presents works from the Israel Museum to illustrate the art and the poetic vision of one of the most innovative masters and highly appreciated and admired Jewish artists of the 20th century. To borrow from the title of one of Bellaʼs books, Chagallʼs lights are still burning. Never a tormented artist, he preserved his optimism and delight in living to the very end of his long life. – Ticket | MostraMI s.r.l.